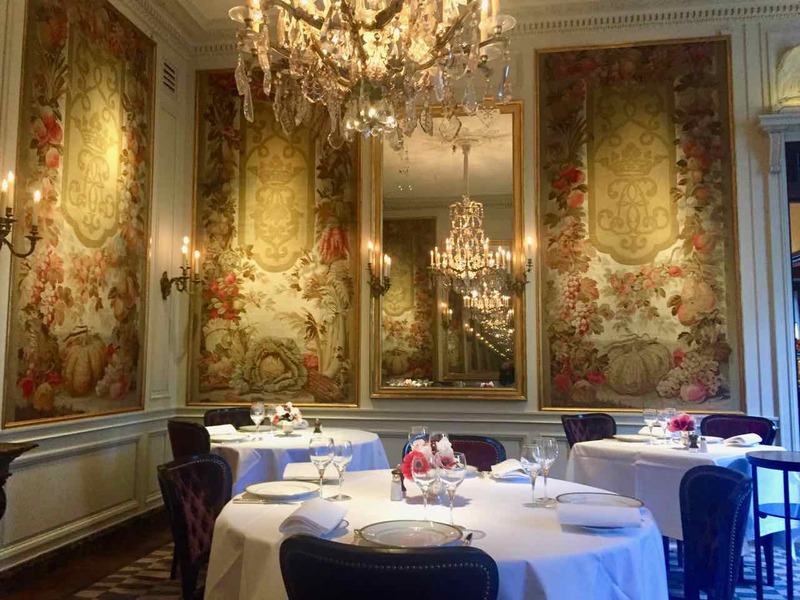 L’Ambroisie, Chef Bernard Pacaud’s 3 Michelin star Paris restaurant, proclaims divinity. Named for Ambrosia, the fruit of the Gods – exceptional delicacies capable of conferring immortality and reserved for divine beings. The name may be a nod to the Greek myths, but L’Ambroisie is one of the most traditional and precise French restaurants in the world. 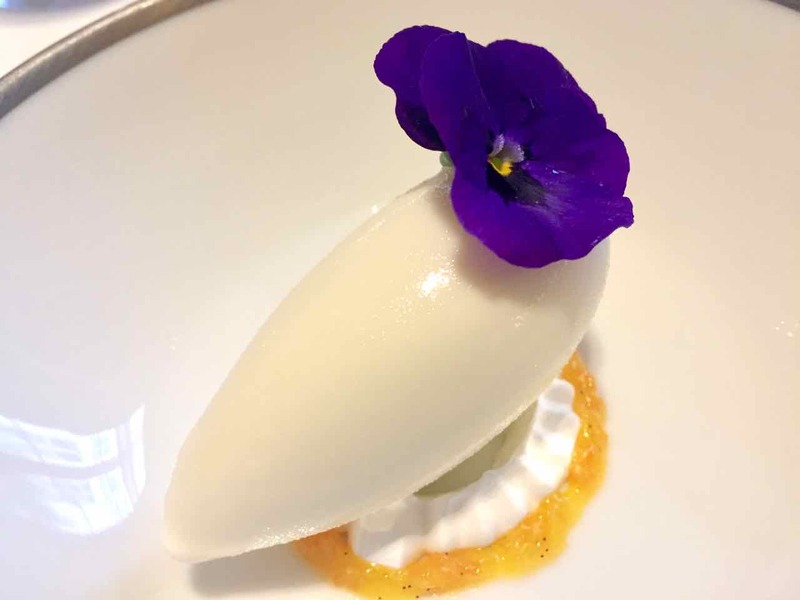 Chef Bernard Pacaud’s reputation is one of refined perfectionism with a focus on the quality and simplicity of the ingredient. 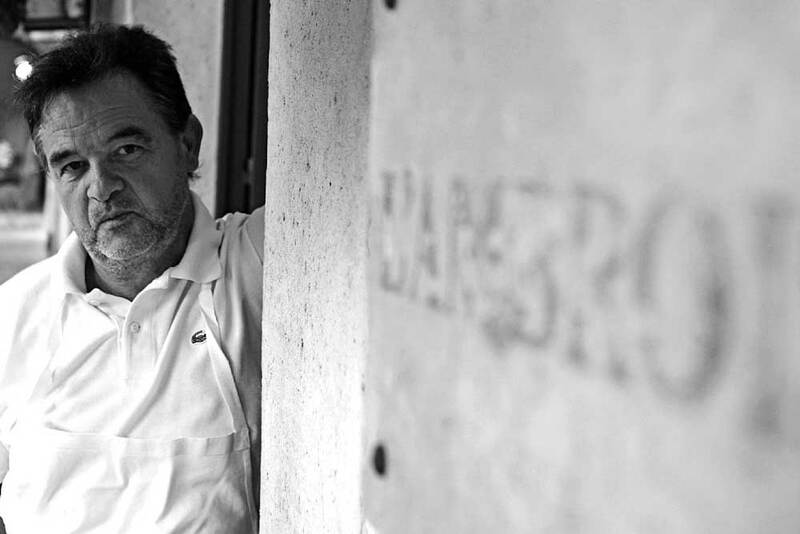 His respectful devotion to haute cuisine has seen L’Ambroisie maintain three Michelin stars for almost thirty years. Imaginings of the taste of immortality tantalise my inner goddess. 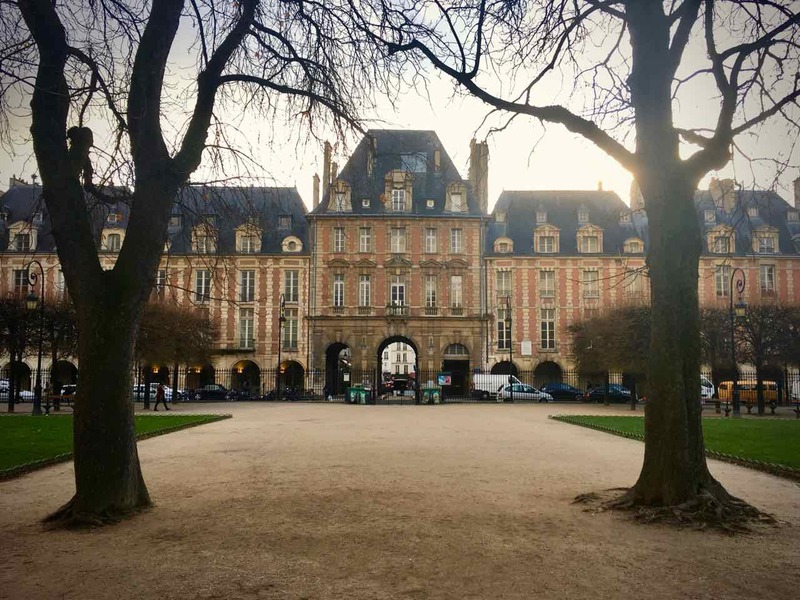 Where better than Place de Voges, one of Paris’ oldest and most beautiful public squares for Chef Bernard Pacaud to situate his ethereal dining rooms. 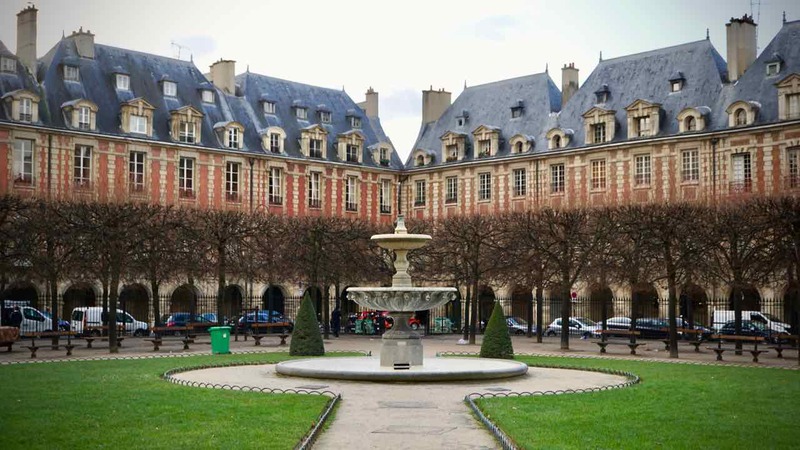 It is an enchanting square in the Marais district of old Paris. Thirty-six luxurious mansions built in the seventeenth century for Paris’ nobility, face onto a glorious central garden. Lush green lawns, trees trimmed precisely and gravel paths laid out with a distinctively French sense of symmetry that is pleasing to the eye. The tall majestic buildings exude elegance with identical architectural structure, the facade textured with a geometric pattern of stone and red brick and steep grey slate roofs reaching to the sky. This place has been home to many famous names. We sit for a moment in the gardens. I gaze up at the second-floor of number 6 where Victor Hugo once lived. I wonder if he sat there at the window looking out at this beautiful garden while he wrote. How from this picturesque place was he able to pen such a heart wrenching and deeply human tale of hardship and suffering as Les Misérables. 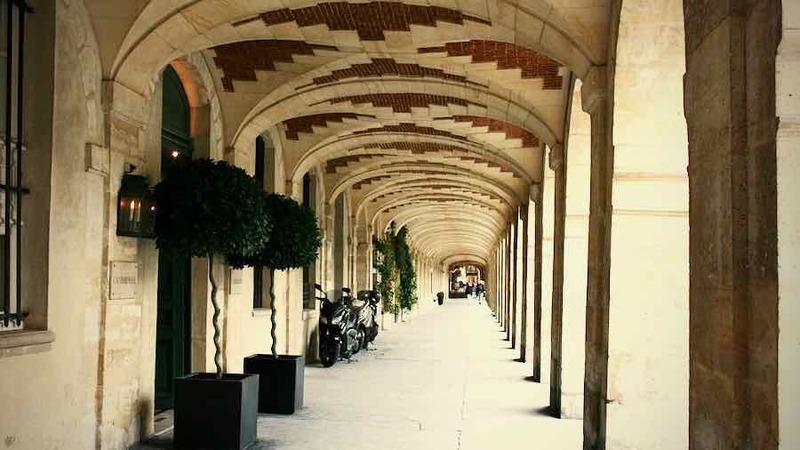 The ground floor of Place des Vosges’ buildings feature arresting colonnades. The wide arcades shelter fascinating galleries, elegant boutiques and stylish cafes. We stroll through, my head tipped back and my mouth gaping, taking in the spectacularly patterned high arched ceilings above me, I am spellbound. It is here beneath the arches, between two potted trees, we find it. The elegant and understated doorway to L’Ambroisie. With a crisply professional but still warm welcome, the host shows us to our table in the first salon. It is a perfectly proportioned room, large enough to hold five tables with enough space around each to feel private. Lofty ceilings contribute to the sense of spaciousness. Yet it is small enough to create a lovely intimate ambiance. It is such an elegant room; I feel its elegance rubbing off on me and more graceful and serene just being in it. Easing onto my plush deep burgundy red velvet chair, I feel transported to another time. Wall sconces warm the soft sage grey walls with candlelight. The light highlighting detailed wainscotting and reflecting off large gold-framed mirrors feels soft and romantic. Tall tapestries soften vast stretches of wall and a sparkling chandelier makes a dazzling centrepiece. Tomorrow is my birthday, we have a special dining trip planned but as it’s not in Paris, my love has decided that the festival of Georgie shall start today. And so it begins with a glass of Dom Perignon 2009 a toast to Paris, a toast to birthdays and a toast to living life out load. Our first treat also arrives. Tradition has every meal here begin with gougères, golden hot puffs of Choux pastry, filled with a robust creamy cheese filling. Our waiter wafts a bowl full of these morsels about in front of us, beckoning us to take one. Making our choice we take a bite. The waiter knowingly waiting for the moment our eyes bug out of head at the first taste. Just as the thought “what is he going to do with the rest of those?”, flashes through my mind, he sets the bowl down in the middle of the table. Ah what a tease, they were all for us all along. We nibble cheese puffs and sip champagne, taking in all the details of this graceful room. I realise all the intricate tapestries are depicting food. Fruit, vines, vegetables, pumpkins, cabbages, peaches, pears, apples, grapes carrots. Delicate soft hues greens pinks and golds create a subtle composition. The small details make me giggle. I love the lizard about to climb up a celery plant and dear little rat cheekily nibbling a cob of corn. Is it a little reminder that the food of the gods is really the food of the earth and for all creatures great and small? 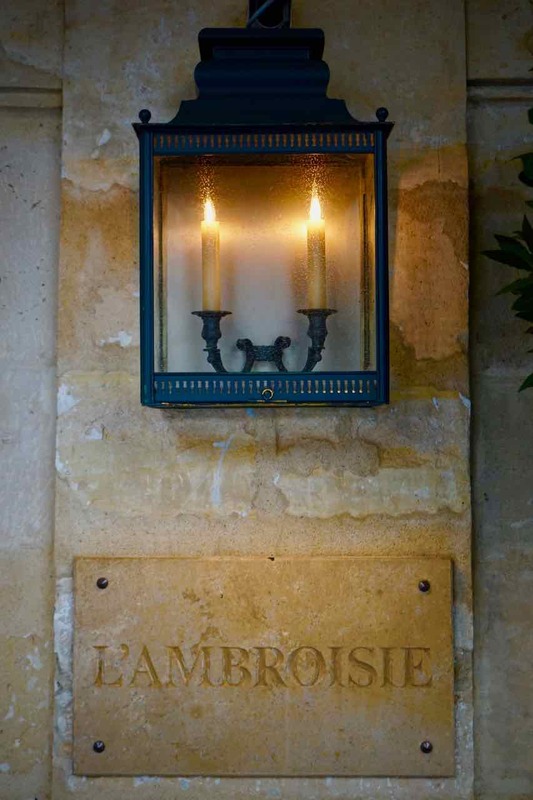 The menu at L’Ambroisie is traditional haute cuisine. There is no sixteen course tasting menu, there is no lunch special. Whether you come during the day or the evening, it is the same. Entrée, main and dessert with only a few options for each. Chef Bernard Pacaud proposes four entrees, a choice of four seafood or four meat main courses and four desserts. Pacaud is not the type of chef who is about continually creating new things. His practice is about perfection. He has worked to honour haute cuisine to the finest level of flawlessness. Many of his dishes are classics. Things he has been doing for years that sophisticated connoisseurs repeatedly seek out. 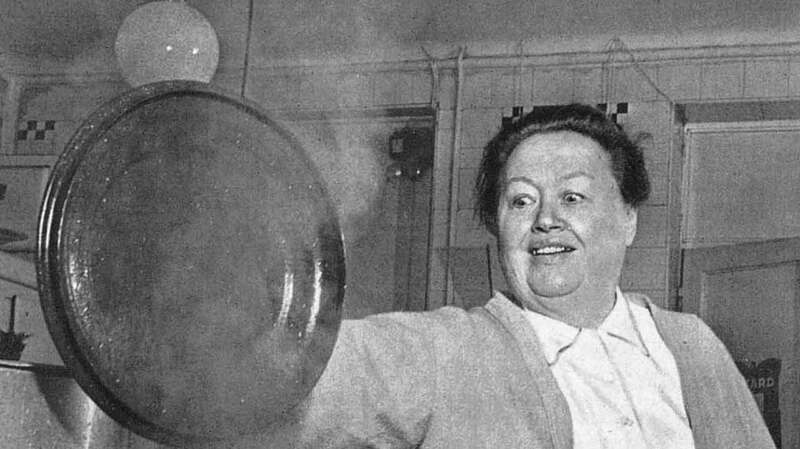 Some dishes and techniques are undoubtedly founded in his early training with chef Eugenie Brazier, the mother of modern French cooking. Bernard Pacaud started his apprenticeship at 15 in Lyon, in chef Eugenie Brazier’s kitchen. She is famously known as the mother of modern French cooking and the first female chef to ever receive a michelin star, and the first 6 Star Michelin Chef. Before you can understand Pacaud you first need to know a little of Eugenie Brazier. I had always had the impression that the professional kitchen is mainly a mans world with a few exceptional women only now breaking down that paradigm. But somehow I never knew about Eugenie. Born into poverty in 1895, with not much in the way of formal education. Her mother died when she was only ten years old. She became a single mother at 19 to a little boy Gaston. She found work as a nanny with the Milliat family, her enjoyment of cooking eventually saw her become the family cook. The next logical step was moving to a Lyonnaise women-only establishment where proud women were stepping out from being domestics to offer stunning dining opportunities in their own restaurants. At only 26 Eugenie managed to buy a little grocery store naming it Le Mère Brazier. She served lunch and dinner with an emphasis on fresh simple cuisine. Ultimately she created a culinary destination that saw her awarded with Michelin stars. Eugenie was not just a woman that received a Michelin star, she was the first chef, male or female, to receive three stars. She also became the first chef to hold the most stars simultaneously, six, across a two establishments. Now here is the kicker, Eugenie held this honour, not for a couple of years, not for a few, but for sixty five, let me say that one more time, sixty-five years. What a woman, what an inspiration and what a brilliant mentor for a young Bernard. You can still see Eugenie’s influence today in Bernard’s menu. Techniques he has learned from her inform his dishes. Sliding wonderful flavours into pieces of poultry between the meat and the skin for example is a classical technique that Eugenie used for her famous Poularde de Bresse demi-deuil (lashings of truffle under Bresse chicken skin) and one that Bernard Pacaud still honours in his own dishes. I close my eyes to take in the fabulous cheesy waft of the last bite of Choux pastry. It is so quiet, all I can hear is the squeak of the waiters leather shoes on the floor boards as they move unobtrusively through the room. My quiet reverie is wonderfully interrupted with the arrival of the egg. Not just any egg, for me this is the egg. We have enjoyed quite a few little eggs in our culinary travels but for this one it is hard to find words that do it justice. Pacaud presents it simply but elegantly, white plate with a gold edge. Silver egg cup and a little silver spoon. As my spoon breaks the surface, the air fills with the wonderful fragrance of truffle. 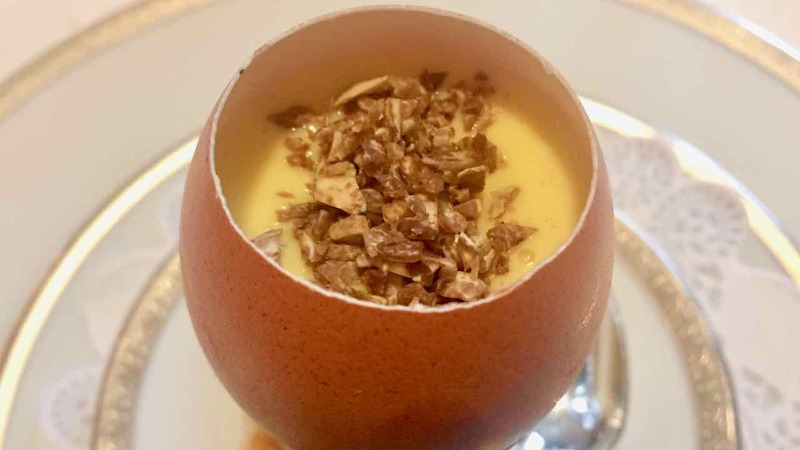 A light fluffy sabayon elevates the rich creamy yolk lifting my imagination to the heavens. Just as quickly and powerfully, the punch of white truffle pulls me right down to earth. It’s almost like the same message of the tapestry, that the gloriousness of food fit for the gods is first and foremost of the earth. Our sommelier moves us on to a Riesling Grand Cru, Kitterle 2012. This Riesling ranks among the best wines in the world and is one of Alsace’s biggest successes. It’s amazing; pretty, gold green colour and the wonderfully vibrant citrus notes and flinty minerality is exciting. On its own gorgeously precise, I can’t wait to see what happens when the food arrives. Our first course, Feuillantine de langoustines aux graines de sésame, sauce au curry, arrives. Visually clever, the dish topped with a crisp sesame disc hiding the wonderfully plump langoustines sitting on a second sesame crisp below. This fabulous little sandwich sits on a bed of tender deep green spinach. The sweet tender and very gently cooked seafood is easily the best langoustine I can remember eating. Crunchy crispy sesame pastry is a perfect contrast to the tender sweet meat and the spinach literally grounds the dish with its faintly bitter fresh vegetal flavour. This amazing stack sits in a shallow golden pool of the most incredible curry sauce. Glossy, smooth, elegant and refined, this delicate fragrant sauce ties the whole dish together. Next, fricassée de homard aux chatâignes et potimarron, sauce diable, our main course. Lobster, dark blood red outer edge and a creamy white interior. Big curls of it snuggled together in a ball in the centre of the plate. Deep orange, sweet, tourned sections of pumpkin with crunchy slivers of raw chestnut between each piece. A pretty plate with the most wonderful fragrance. 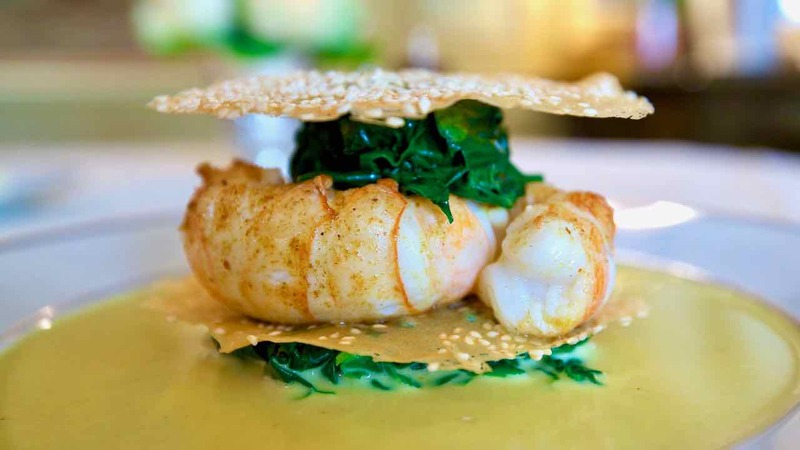 The sweet lobster is tender, gorgeous and juicy. And then there is the sauce. The sauce is exquisite, elegant and so much more. Its depth is unbelievable, think caramel, toffee, buttery spiciness. I don’t know what the recipe might be, but I imagine Bernard nursing lobster shells coaxing the essence of lobster from them to create this wonderful condensed caramelised sauce. Every single element on this plate sings a pitch perfect note. The sauce is the melody, the composition that sets the rhythm and draws each note together in the most uplifting harmony. The pace of service has been absolutely perfect with enough time between plates to contemplate each one and anticipate the next. Our chat flits from one thing to the next other as we celebrate our main course and entertain the possibilities of the dessert to come. A delicious little pre-dessert starts the sweet juices flowing. Perched on a tiny meringue surrounded by a thin squeeze of orange gel is a shiny quenelle of sweet almond ice cream, decorated with a deep purple violet. A brilliant progression from the lobster. For dessert today I opted for soufflé. 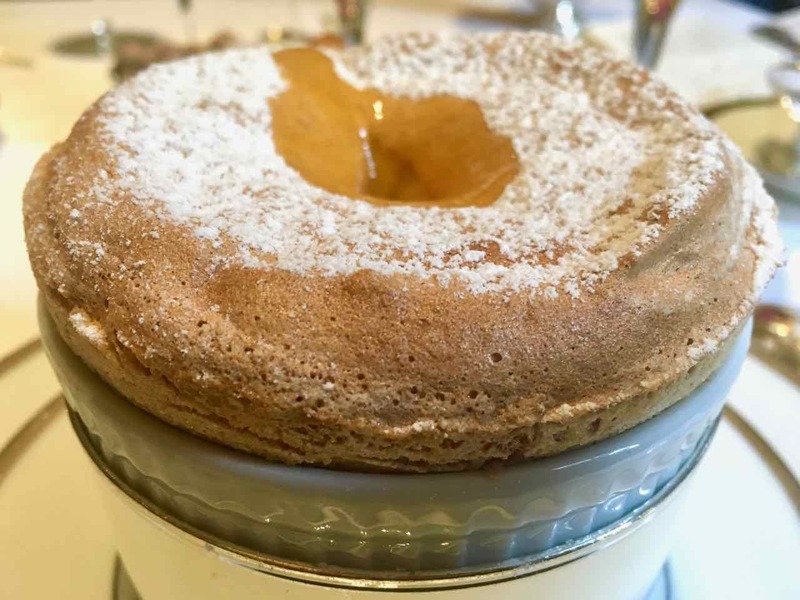 I could not pass up an opportunity to taste a soufflé cooked by chef Bernard Pacaud. The plate appears before me, breath, the literal translation of soufflé is breath, how perfect. I take a deep one, inhaling the warm, vaguely nutty aroma. Mango coulis poured into the centre followed eagerly by my spoon. Oh my goodness, this is the most perfect soufflé I have ever eaten. I happily inhale ethereal light spoonfuls, the mango bringing a fresh little twang. Hidden in the bottom is a crispy surprise, praline, a sublime contrast to the softness of the rest of the dish. My love ordered chef Bernard Pacaud’s signature chocolate tarte. It has been on the menu for more than 30 years. Plated simply, a slice of chocolate tarte dusted with cocoa and a quenelle of ice cream in a wide shallow white bowl. Its visual simplicity belies the intoxicating intricacy of the textures and flavours in this dish. 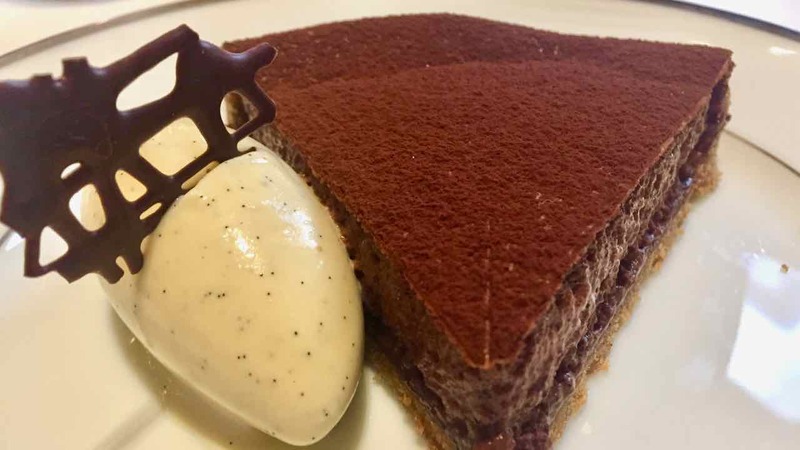 A wonderfully dark chocolate tart rich in flavour, yet it’s texture light as air. Warm notes of smoky bourbon a playful surprise floating through the tarte and the vanilla bean ice cream. Tipped off that it’s my birthday celebration the kitchen send another of these stunning chocolate tartes for me. Such a lovely gesture but I’m not sure I can manage two desserts. What I would really love to ask for is that an entire tarte is boxed up so I could have it for breakfast, lunch and dinner for the next couple of days. What is wrong with that I say, it makes perfect sense. A magical dessert course, two very special dishes that I know will stay with me for a very long time. Petit fours are the final indulgence for the day. The classical canelé, a little cake crispy on the outside and moist on the inside and absolutely divine. They inspire us to track down canelé moulds to take home. 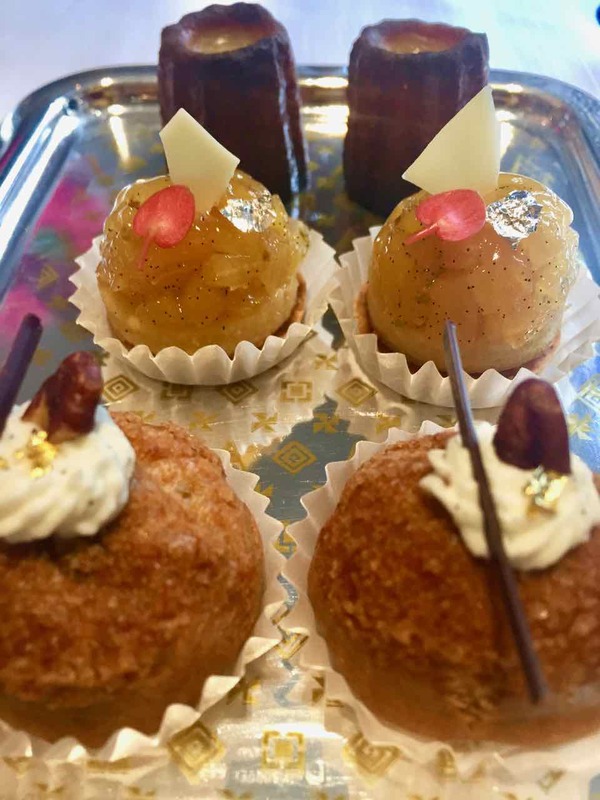 A gorgeous creamy hazelnut honey glazed puff and a velvety fruity pineapple bite complete a special tray of delicious treats. Today has been a truly divine experience, L’Ambroisie is just the food and you. For us it has been a meditative solitary experience where when the food arrives, everything around us fades away. The service has been absolutely perfect. How is it that you can feel you have been so well cared for and special while the service has been so discreet it has almost been invisible? Chef Bernard Pacaud has exceeded all my expectations. There has not been one single element that has not been perfect. There has been no trickery, no flashy avant-garde plating, no foams, gels, dry ice haze required. He has simply expressed his focus on taking the best luxe ingredients and cooking them to absolute perfection. His is quintessentially French traditional style haute cuisine. And he is absolutely the master of the sauce. As we sit quietly relaxing and reflecting in our last moments here, I now understand why L’Ambroisie is mentioned as possibly the best restaurant in Paris and what Chef Bernard Pacaud means when he says; “Offer the best, simply”. It is so special that in 1997 it broke deep-rooted diplomatic tradition when American President Clinton became the first visiting President invited to dine outside the Élysée Palace. Several Presidents since, including President Obama and President Holland have also dined here. Now this was no small thing. On one hand the essential Frenchiness of the tradition of foreign dignatories being entertained only in the Elysee Palace was an incredible tradition to break. And then can you imagine the lengths that security would have had to go to? In an interview by Nathalie Molho, Bernard’s wife Daniele talks about having CIA tasters posted in the kitchen, the entire perimeter of the restaurant being secured and helicopters hovering above the restaurant for the duration of these Presidential dinners. And so why? Why would world leaders take huge risks to dine here? Why would the passionately traditional French toss their tradition to the wind? 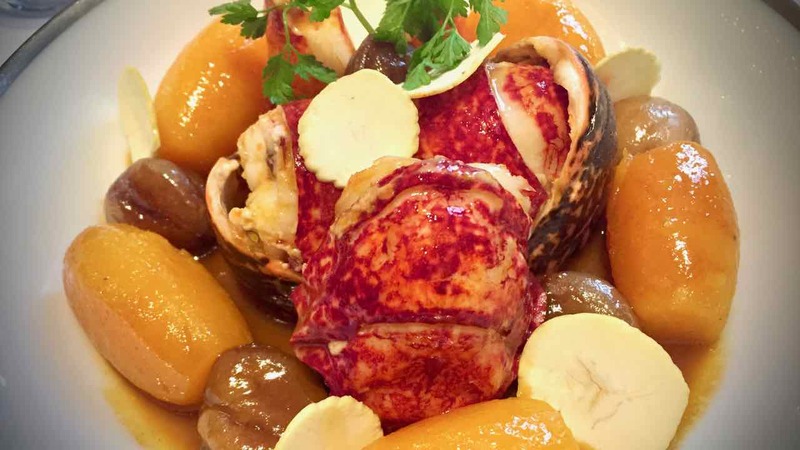 Because for anyone seeking a perfect expression of French gastronomy – L’Ambroisie is it.